Tarsal tunnel syndrome is a condition whereby the tibial nerve is irritated, causing a burning or tingling sensation. The tarsal tunnel is formed by bone on one border and fibrous tissue on the other. The tunnel is on the medial aspect of the ankle extending from the hind foot at the region of the medial malleolus (large bony protrusion on the inside of the ankle) forward to the navicular bone. The talus and calcaneus or heel bone form the lateral or outside of this tunnel. It is also bordered by several of the foot muscles. Within this tunnel runs the tibial nerve, which splits into a medial and lateral plantar nerves. The tibial artery and vein also run through this tunnel. Depending on where the nerve is irritated, different symptoms will develop. If the entire tibial nerve is involved, then the symptoms will be burning and a tingling sensation along the entire sole of the foot. These symptoms are made worse with increased activity or compression of the ankle. There are usually no associated motor symptoms (abnormalities of muscle function) unless it is extremely affected, but this is rare. The posterior tibial nerve divides into the medial plantar nerve and the lateral plantar nerve. If the medial plantar nerve is irritated, symptoms will affect the inside of the foot. 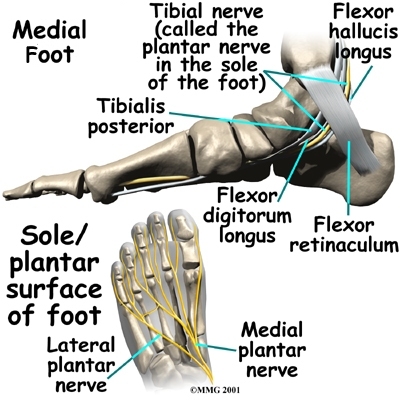 If the lateral plantar nerve is involved, then symptoms will affect the outside of the foot. Tarsal tunnel syndrome pain can be diffuse, and can be an overlooked source of ankle or foot pain unless a skilled clinician is evaluating for the syndrome. Magnetic resonance imaging (MRI) scanning can help to evaluate whether there are ganglion cysts, nerve sheath tumors, enlarged tendons or scarring in this region, all of which can cause similar symptoms. It can be defined with electromyography (EMG) and nerve conduction studies (NCS). EMG and NCS are tests that measure muscle and nerve function. The Tarsal Coalition or enlargement of the subtalar joint due to bony spurring from degenerative arthritis may also cause compression along the nerves. This condition can also cause irritation of the tendons that align this region, specifically the posterior tibial tendon, the flexor hallucis longus tendon and flexor digitorum longus tendons. Since there are a variety of different conditions that may result in chronic ankle or foot pain, finding the root cause for the pain is extremely important to developing the correct treatment plan. If the cause is a simple irritation, then rest and anti-inflammatory type treatment is effective in mild tendonitis of acute origin. Surgical intervention can usually be avoided in the case of chronic tendonosis or scarring of the tendons and the course through this area. If it is a chronic pain condition causing significant limitations in the ability to walk and if it is a result of degenerative arthritis or tendonosis of the musculature, then platelet-rich plasma (PRP) or stem cell therapy may be effective in regenerating the involved segments. Platelet-rich plasma (PRP) and stem cell therapy are regenerative medicine techniques that may regenerate tissues that are chronically irritated and inflamed or undergoing degeneration or scarring. If you suffer with tarsal tunnel syndrome and your current treatment plan leaves you feeling hopeless, perhaps a fresh set of experienced eyes can change your outlook. Since 1990, Dennis M. Lox, M.D has applied his personal interests in sports medicine, cutting-edge regenerative medicine and chronic pain management to helping patients increase their quality of life. Contact us for an appointment at 727-462-5582.